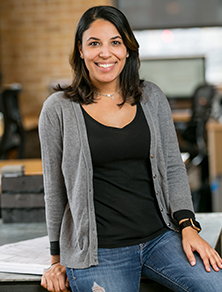 Luciana is an Assistant Project Manager at Centaur Construction. As such, she is responsible for assisting Project Managers in overall coordination from inception to completion. She is there to ensure the project is on schedule and sustains budget. She achieves operational objectives by contributing information and recommendations to strategic plans; preparing and completing action plans; implementing production, productivity, quality and customer-service standards. Luciana was born and raised in Venezuela, and moved to Miami when she was 14. She attended Miami International University of Art & Design, where she received her BFA in Interior Design. Her early experience includes interior design & project management for residential and commercial build outs and remodels. Soon after, she began working in retail construction in Miami’s Design District, building out renowned stores such as Dior, Loewe, Emilio Pucci and Christian Louboutin. Additionally, Luciana managed new luxury residential construction in Golden Beach, FL. Being a fearless young woman, Lucy brings a fresh approach to construction. She has an innate ability to solve problems and may see things differently than her peers. Her exposure to different cultures and personalities helps benefit her when she interacts with clients and subs on projects. Lucy moved from Miami to Chicago to join the Centaur Team. New to Chicago, she is looking forward to riding her bike during the summer months and getting used to the cold winters. Luckily, her Amazon Prime membership has come in handy for a brand new winter wardrobe. Luciana loves museums, food, music, traveling and everything Christmas.